There's year-round trout fishing in Lake Taupo District. For those anglers in the know, the spring and early summer period, October through to Christmas has always been a premium time. 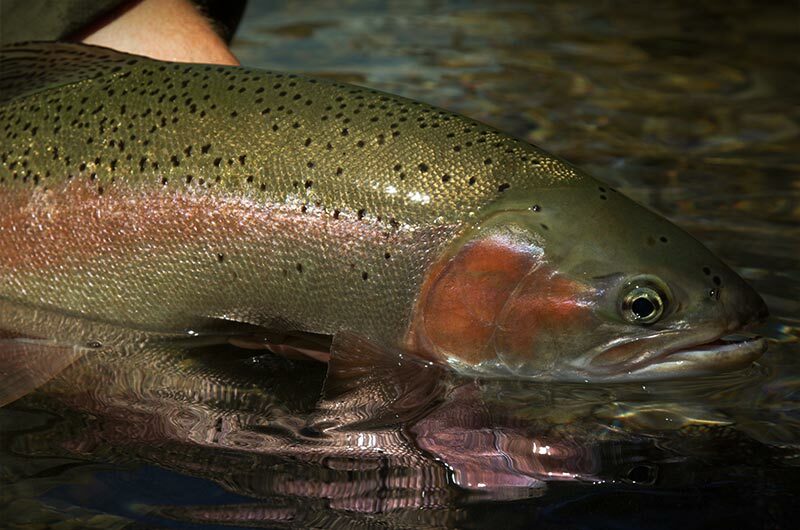 The rainbows and browns tend to feed more aggressively and be less spooky early season. It is quite a sight to watch a feeding trout move 10 feet to engulf your fly! By November the days are long and the sun is higher, making spotting and stalking conditions ideal. The waters are less busy. Nymph fishing is often used but there can also be excellent dry fly fishing with good mayfly hatches along with brown and green beetle by mid November. Helicopters can be used to access remote wilderness rivers that provide the ultimate in fly-fishing to sighted trout. Locally the rivers around Tongariro Lodge hold many trout left from the winter runs out of Lake Taupo. Many of these trout migrate back to Lake Taupo, but a number of them remain in the tributaries and begin to feed after their winter spawn. December will often see the start of the dry fly fishing. Our first major terrestrial insect appears being the 'Manuka' or Green Beetle. Warmer water temperatures also stimulates aquatic insects, with the Mayfly and Caddis getting more active. Lake Otamangakau is one of New Zealand's trophy trout fisheries. It has a great damsel hatch starting in December and is located only 20 minutes from Tongariro Lodge. Fly fishing over weed beds and off the shoreline for cruising trout produces many 25 inch to 30 inch rainbows and browns each season. Fly fishing on Lake Taupo improves with the warmer spring weather. The major bait fish on the lake, called smelt, spawns in the shallow lake shore water during this time. Browns and large numbers of rainbows can be seen charging these shoals of minnows. Wading around the shoreline of the Tongariro Delta, sight casting to these cruising trout, is often compared to the flats fishing at Christmas Island. The first of December is opening day on the Taupo tributary headwater streams. This always provides great angling for trout who have not seen a fisherman for six months. A wilderness rafting trip on the upper Tongariro offers spectacular fishing at this time. This is prime dry-fly time to go wet wading up a stream and cast to sighted fish. In the central North Island our most important hatch is the Cicada. It will usually start mid January and last until the first couple of cold snaps in fall. Hot, dry weather is needed to stimulate these terrestrials to come our from underground. When it happens you will see action to rival any hopper hatch in Montana. Fishing both streams and lakes with Cicada imitations is considered by both clients and guides to be some of the best fly fishing in New Zealand. In a good hatch, many double digit browns are landed below our lodge on the Tongariro River. Lake Otamangakau is also famous for its Cicada hatch, rises here can be seen 200 yards away at times. Most of our helicopter fishing is done at this time of year. Most headwater streams are low, this often relocates the trout into the faster water giving the angler a slight edge Flying into these wilderness streams is the ultimate fishing experience. Wilderness raft access fishing in the upper and lower Tongariro river is at its prime during this time. Fall can be a great time to fish the back country of the central North Island. An Indian Summer during April is not uncommon and gives you warm days to fish in but with cooler nights. The trout are in prime condition after feeding on the abundant insect population all summer. All headwater fisheries are open until the end of April and some into June. Helicopter access is still an option. You may catch the last of the Dry Fly season, but it is more likely you will cast nymphs at sighted trout. Fishing pressure is very light on these streams at this time of year. Raft fishing the head waters of the Tongariro can be great targeting the early runs. Each fall also see the commencement of the annual migration of Lake Taupos' rainbow trout up its tributary rivers and streams.These headwaters of these tributaries are open until the end of May and offer miles of great fishing water. Trout range from 4lb to 6lb with larger trout often caught during the early run. Brown trout are also running at this time of year with some 30 inch plus fish landed each season. These trout readily take a nymph or streamer, with a number 8 rod not out of place on the river at this time of year. In an average season 40-50,000-plus adult rainbow and brown trout migrate up the Tongariro River alone. The Lake Taupo fishery is the only area in New Zealand that remains open to fly fisherman all year. The lower sections of the tributary rivers and streams provide access to Taupo's large run of wild winter steelhead. With five of these tributaries within a twenty minute drive of Tongariro Lodge you can understand what a great winter fishing destination it is. Lake Taupo is one of the most productive trout fisheries in the world. From May-October is the prime time to target the large adult rainbows averaging 4 - 8 lbs running up Lake Taupo's tributaries to spawn.The days are crisp and temperatures average 55 F, and it is often possible to fish wearing light winter clothing only in mid winter. The main method is upstream nymphing and truly magnificent sport can be had targeting these bright silver hard fighting fish; they cartwheel, jump and run just like a steelhead! Truly exceptional numbers and size of fish can be taken during these months. It is a popular time for local fisherman also.